Audiovisual entrainment (A.V.E.) is a technology that may be used along with neurofeedback sessions or as a stand-alone tool to enhance certain types of brainwaves that are associated with desired states of mental, physical, and/or emotional functioning. Through the use of an A.V.E. 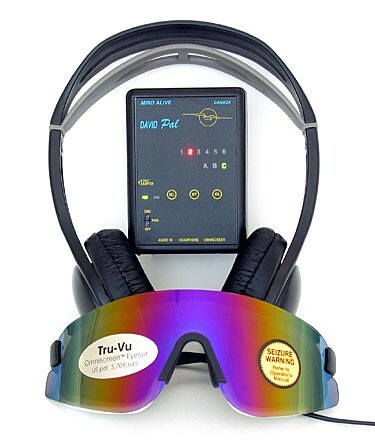 device one experiences what is called brainwave entrainment. This is when visual or auditory stimuli are presented to the individual to produce a frequency-following response in the brainwave patterns, meaning that the brain is guided into greater production of brainwave states associated with health and optimal performance. For instance, it is often desirable to produce a balanced state of alpha brainwaves for the purpose of enhancing relaxation or reducing depression or anxiety. A.V.E. technology can assist in boosting the individual in producing desired brainwave states in a controlled setting such as a neurofeedback session, or if a client wishes to use this technology between sessions to maintain and amplify their progress. A.V.E. technology has been studied in use with a number of conditions and demonstrated positive benefit in reducing symptoms and/or enhancing function. There is some research support for use of A.V.E. to enhance cognitive function, learning and concentration; decrease anxiety; reduce some forms of depression; and aid in relaxation and reduction of certain pain conditions, including TMJ and fibromyalgia pain. There are some conditions for which A.V.E. is not a suggested adjunct to treatment. An assessment and discussion of these is done prior to use of this technology.